If you are a startup and you would like to apply to pitch, you're on the right page! If you don't want to pitch, but you want to network, have the opportunity to watch the competition & learn about the Indian market: click here. If you want to be a partner of the event or you are a late stage startup and you plan on scaling into India, send us an email at hello@whub.io and we can organize a consultation. Get your game face ready because the Million Dollar Challenge is coming to HK on Sept 27! WHub is proudly co-hosting this Pitchfest, where top 3 winners of the 25 finalists invited to pitch in India get US $150K each! The global roadshow of the Vizag Challenge, held by the Government of Andhra Pradesh in India, is a global series including Tel Aviv, Paris, London, Hong Kong and India. 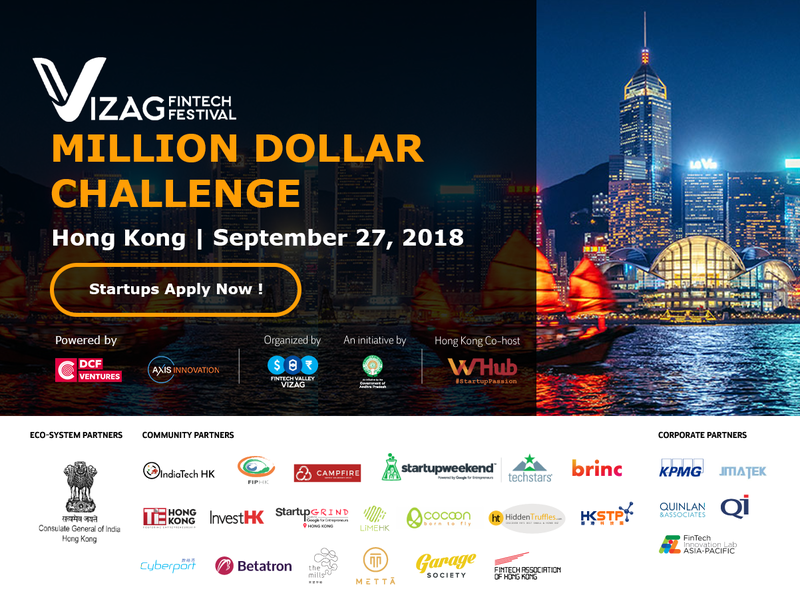 Seize this opportunity to go head-to-head with global innovators in FinTech, AgriTech & EmergeTech! Five day festival between 22nd to 26th October that focuses on Fintech, Financial Inclusions, AgriTech and EmergeTech. The conference will host an exclusive group of leading corporates, start-ups, academia and regulators from around the globe who will meet up and explore how these technologies will impact the future. It is a part of series of roadshows happening in UK, France, US, HK and India. we will be honored with having Mr. JA Chowdhary, Special Chief Secretary & IT Advisor to the Chief Minister of AP present and representing the State of AP. It would also be attended by other delegates such as Mr. Anoop Singh Special Secretary, Department of IT, Govt. of Andhra Pradesh, Venture Capitalists, and other members of the start-up ecosystem in Hong Kong.